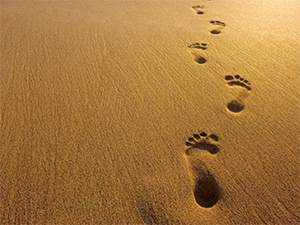 If your footprint looks like an oblong pancake with toes, you pronate excessively or may have flat feet. Try molded-leather arch supports, which can be purchased in many drug stores. And when shopping for athletic shoes, ask a sales clerk for styles with “control” features—soles designed to halt the rolling-in motion. If arch supports or sports shoes don’t help, please contact our office for a custom-molded orthotics. If there’s little or no connection in your footprint between the front part of the foot and the heel, you under-pronate or have a high arch. This means a lot of your weight is landing on the outside edge of your foot. Ask for “stability” athletic shoes, which are built with extra cushioning to remedy this problem. If you are prone to ankle sprains, wear high-top athletic shoes that cover the foot and ankle snugly to minimize damage from twists.